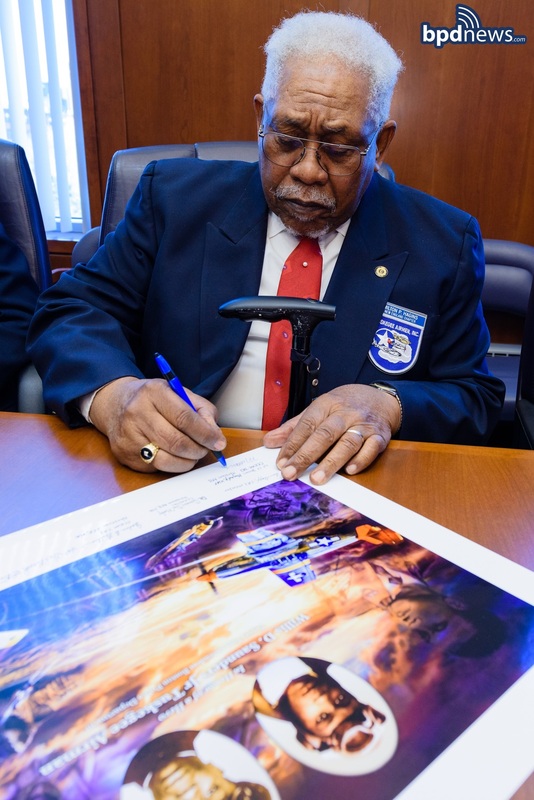 On Friday, April 29, 2016, members of the legendary Tuskegee Airmen were on hand to honor one of their own as Commissioner William Evans and Superintendent in Chief William Gross unveiled a painting in tribute to former Deputy Superintendent Willis D. Saunders Jr.
Willis served with distinction as a member of the Tuskegee Airmen during World War II before joining the Boston Police Department in 1956. The painting, which was signed by those in attendance, features images of Willis as a young pilot and later as a rookie police officer. The Boston Police Department would like to thank these amazing men for their service to our country and for taking the time to come by today to share their priceless memories and stories with us – it was an honor.